“Be thankful for what you have; you’ll end up having more. If you concentrate on what you don’t have, you will never, ever have enough.”– Oprah Winfrey. Nov 30th: School Spirit day. Turquoise & purple. On November 20th, all parents are invited to participate in our Thanksgiving luncheon. Teachers will be having parties in their classrooms to celebrate being thankful for our friends and families. Children will do activities related to Thanksgiving and have a Thanksgiving lunch with their parents. Please check your child’s door for a signup sheet. Thank you for choosing P.A. Geraci Child Development Center for your child’s early learning experience! Daylight saving time is just around the corner and that means one thing: It’s time to change the clocks. 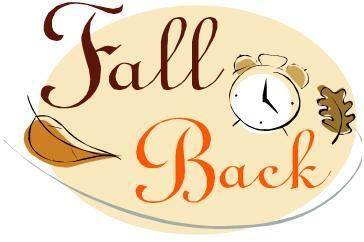 Make sure you set your clock back by an hour on November 4th. Monday, November 26th: Rooms 2, 4, 6/7 & 8. Class pictures. Tuesday, November 27th: Rooms 1, 3, 5 & siblings. Class pictures. Student and parent dress code is strictly enforced! Please sure that you and your child(ren) are fully dressed before entering the building. Parents please make sure your pants are pulled up and no other body parts are exposed. Parents if you are having someone else pick up your child(ren) please make sure you add them to your pick-up list, speak with Ms. Tara or Ms. Kay and remind that person to bring a valid ID with them. No child will be allowed to leave without a valid ID and notification from a parent or legal guardian. The age requirement is 18 years old to sign children out. Preheat oven to 375° and line two large baking sheets with parchment paper. In a small bowl, whisk together flour, baking soda, cinnamon, salt, and nutmeg. In a large bowl using a hand mixer, cream together butter and sugars until light and fluffy. Beat in sweet potato, egg, and vanilla, then add dry ingredients and mix until just combined. Stir in chopped pecans. Scoop 1” balls onto prepared baking sheets, 2 inches apart, and bake until golden and just set, about 10 minutes. Cool on baking sheets 5 minutes then place cookies on a cooling rack and let cool completely. Make glaze: In a medium bowl stir together powdered sugar, syrup, milk, and pinch of salt. Drizzle glaze over cookies and sprinkle with chopped pecans. The birthstone for November is Topaz. The zodiac signs for November are Scorpio or Sagittarius. The birth flower for November is Chrysanthemum.